These tasty kid-pleasing bars are made with wholesome oats, butter and brown sugar. Pre-heat oven to 350 degrees F. Coat an 8×8-inch baking pan with vegetable cooking spray. Line with heavy-duty foil, leaving an overhang on two sides to facilitate removal of bars from pan. Coat foil with cooking spray. Mix flour, oatmeal, sugar, and salt in a medium bowl. Stir in butter with a fork until well mixed and clumps form, and then spread half the oatmeal mixture over foiled pan bottom, pressing to form a thin crust. 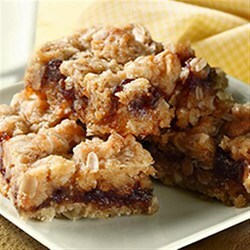 Spread apple butter over crust and then sprinkle remaining oatmeal mixture on top. Bake until crisp and golden brown, 30-40 min. Cool to room temperature. Use foil handles to remove bars from pan. Cut into squares and serve.